Great tips for growing lettuce indoors in a container vegetable garden. How to plant, grow, and care for lettuce plants in indoor container gardens. Planting lettuce indoors can be accomplished easily because the vegetable is well suited for container vegetable gardening. Among the beneficial reasons for indoor gardens are fewer pest problems, no scheduling cultivation around outside weather conditions needed, and no digging in the dirt required! 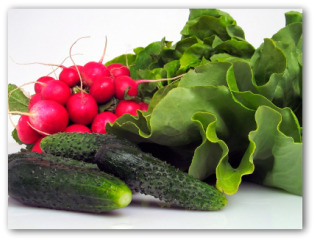 Lettuce is a very fast growing, hardy annual with either compact or loose leaves. Leaf color ranges from light green through reddish brown. Iceberg lettuce, the most commonly found in grocery stores, is the most difficult to grow. However, leaf lettuce is easily grown. Butterhead lettuces, which have loose heads and delicate crunchy leaves, are even easier to grow. Romaine lettuce forms a loose, long head and is between a butterhead and leaf lettuce in flavor. An easy way of growing lettuce plants is using hydroponics. One of the reasons this vegetable gardening method works so well is because lettuce needs to retain moisture to grow successfully. 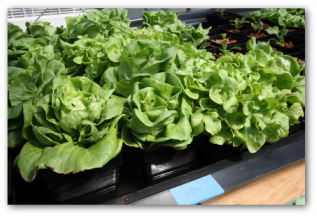 With hydroponics, the shallow roots of lettuce plants are kept evenly moist. Many gardens experienced with this system recommend choosing the Ebb & Flow technique using Rockwood cubes for the best results. For beginners, invest in indoor grow-lights and a timer. Four CFL lamps should be sufficient for a simple set-up. As a "green" savings, choose an output equivalent to a 60W light bulb, although, the CFL lamp will only consume 15 W.
To simulate the sun, grow-lights need to be timed to operate for twelve hours off and twelve hours on. 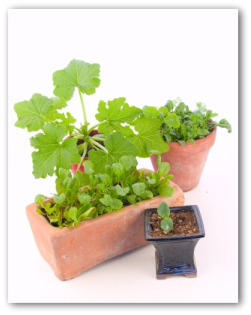 Terracotta containers absorb water readily, which dries out the soil inside more rapidly than pots designed of other materials. To counteract drying out the aoil medium, line plastic shopping bags inside of the containers, making holes in the bottom of the plastic lining for drainage. Some gardeners suggest soaking the containers prior to planting so the pots do not take away vital moisture needed by young plants. When using recycled pots, wash them out thoroughly with 9 parts water to one part bleach to kill any bacteria or fungus. When growing lettuce in pots, don't bury seeds too deeply. Plant seeds with thin coats need light to germinate. Sow lettuce seed near the surface, so light will trigger germination. When growing lettuce indoors, it is important to keep the plants properly ventilated as well to prevent the crop from bolting. As your lettuce grows harvest either the entire plant or just the outer leaves and leave the inner ones to continue developing. You can enjoy a continuous crop when growing lettuce indoors. Lettuce leaves are 95 percent water, and that is what makes them so crisp. The water-heavy cells are tightly packed against each other, producing the crunchy texture. For scientific reasons that are much too boring (my apologies to scientists everywhere) to go into having to do with osmosis, you can restore some crispness in limp lettuce leaves by simply submerging them in water. Below we have included a delicious traditional French recipe that actually calls for wilted lettuce! Boil and drain your beans. Sauté some garlic and thinly sliced onions until they are soft. Then add shredded lettuce in the skillet, after a minute or so, when the lettuce has wilted, add the beans.